Reprint is in March 2019! A new paperback edition of a wonderfully evocative cookery manual by one of England’s greatest modern food-writers. 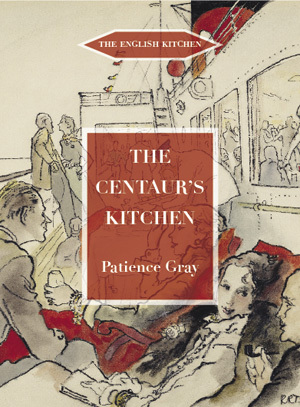 The Centaur’s Kitchen had never (before 2005) been shown to the public, except in the galleys and state-rooms of the ships that once sailed under the ensign of the Blue Funnel Line. It was written in 1964, at the request of the company chairman, to better instruct their Chinese cooks in cooking fresh and flavoursome food. In a few short chapters, Patience Gray lays out a whole repertoire, drawn mainly from the Mediterranean and France, that might be cooked on board ships. Her aim was to wean the cooks off frozen, dried and packeted food and to respond to both the seasons and the supplies available at ports of call. The style of cookery was much as in her earlier, and first, book Plats du Jour (1957): retro to us, bourgeois French in another form of shorthand. The style of writing is eloquent and prescriptive: the author keen to impart good habits as well as good cooking. Thus there are chapters about equipment and kitchen basics as well as mere recipes. The text has been illustrated by Miranda Gray, the author’s daughter. Many of the pictures, just as the title, draw on Greek mythology. The reason for this is the Blue Funnel Line’s custom of naming its ships for mythological figures (Centaur, Ariadne, Neptune, etc). Other drawings evoke the author’s life beside the Mediterranean in Italy and the Greek isles. Patience Gray died in 2005. Her work has always been the intellectual acme of the cookery-book world. Although her output was tiny, her fame is infinite.